Are you having trouble getting your plants to flower? There are a few easy-to-fix mistakes that could be preventing you from seeing a harvest. Are you having trouble getting your plants to flower? There are a few easy-to-fix mistakes that could be preventing you from seeing a harvest. Here’s what you can do when your plants just aren’t flowering. Like all other plants, marijuana requires energy from the sun in order to grow. When planted outdoors, cannabis follows a natural, seasonal grow cycle. Vegetative growth happens in the late spring and early summer. The flowering phase occurs during mid to late summer. Flowering is triggered after the summer solstice when the nights begin to get longer again. Because healthy growth follows seasonal cycles, providing your plant with the correct light for different lifecycle stages is essential. Your plant will not flower if it’s not given the correct kind of light for the right length of time while it’s growing. If you’re growing indoors, it’s necessary to re-create their natural light environment in order to get great results. There’s a simple rule for making sure your light is right when you’re growing weed. Blue light is for vegetative growth, and red light is for flowering. Think of the quality of light you typically see during the spring. During spring, you’re farther away from the sun than you are during late summer. Cooler, blue light waves are more abundant in the spring. Hot, high-energy red light waves reach their peak in the heart of summer. If you’re growing indoors, investing in a red/blue spectrum LED grow light can reduce the hassle of switching light bulbs when you’re ready to flower. Another popular option is an HID grow light kit, which typically comes with two different bulbs used for the two different phases of the growth cycle. Using the right lights is vital for getting your plants to flower. But, the time spent in the dark is another factor that you can’t overlook. During the vegetative state, many indoor growers choose to leave their lights on 24 hours a day. If the plants begin to show signs of stress during the veg phase, you can bump them down to 18 hours under the light and 6 hours of complete darkness. Once your plant gets to a healthy, durable size you can force it to flower by putting it under a strict 12/12 light cycle. That’s 12 hours beneath the red light and 12 hours in complete darkness. The 12/12 cycle is meant to mimic summer nights after they begin to get longer post-solstice. Any light leaks or interruptions that happen during the 12/12 phase can stop your plant from flowering and send it back into vegetative growth. Some experts even suggest that something as simple as shining a flashlight on your plant during its artificial nighttime can force it back into veg. You might want to consider investing in an automatic light timer to make it easier stick to a strict light schedule. You might want to consider investing in an automatic light timer to make it easier stick to a strict light schedule. Whether you’re growing indoors or outdoors, different strains mature at different rates. Certain strains also work better for different climates and latitudes. 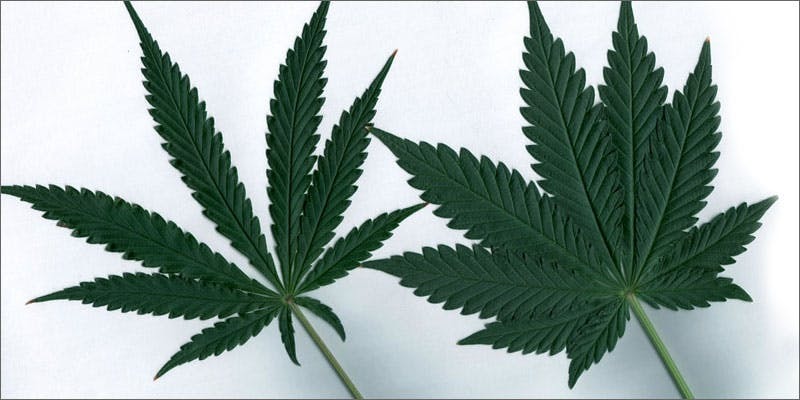 Sativas tend to grow tall, take their time to reach maturity, and perform better in warmer climates. Indicas tend to do best in cooler climates, reach maturity much more quickly and are generally small and stocky plants. An indica will flower in about 45 to 65 days. Sativa dominant strains will flower between 60 and 90 days. If you’re growing a sativa, you can also expect a huge spike in vegetative growth once you switch it into flowering phase. If you’ve got your light situation under control and you still feel like your plant is taking forever to start flowering, you may simply have a slow-maturing sativa dominant strain. If you’re growing outside, getting the most out of your plants means following practical gardening instructions for your particular region and climate. Plant during the spring when blue light is abundant and expect a harvest sometime after the summer solstice. If you’re growing indoors, try your best to create an artificial environment that mimics the plant’s natural light and grow cycles. If you feel like things are taking forever, do your research and find out what you should expect from your chosen strain. Have you had trouble getting your plants to flower? Do you have any tips to share? Write to us on social media or in the comments section below. We’d love to hear from you!